SEO vs PPC or SEO <3 PPC? Depending on which side you fight for, SEO or PPC, it’s understandable to be protective of what you love. But there are some benefits to gingerly coming out from hide-and-secrecy in pursuit of the greater good…whether that be for your brand, or a client. The Battle of the SERP is no longer a one-channel race. Hedge your bets, share your data, GO! Whatever tools and methodology you use to assess the quality of your links or source new ones, there are learnings to be had from Google Ads data. By heading to the Display tab > Where Ads Showed tab you will find a list of placement domains upon which remarketing and prospecting ads were displayed. While this list can be as long as your arm, utilise filtering options to source the ‘best domains’ depending on your objectives. Want to increase traffic? Sort by high clicks or filter by above average CTR. Ad CTR can be a good indicator of two things; an engaging ad, and targeting the right audience. Display CTRs can be pretty low compared to Paid and Organic search, so as SEOs, don’t be perturbed if prospecting display campaign CTRs aren’t over 0.5% or remarketing campaigns over 1% for the data you’re analysing. These are by no means averages, as other factors such as client media spend, size of audience, bid price and industry averages can also affect CTR. Rather focus on better sales and revenue? Filter by ‘at least 1 conversion’ or ‘at least £0.01 conv. Value’ to find the most valuable potential domains for your next outreach activity. Now you’ve got your list of domains, run them through any internal checkers you have to quality control the sites are relevant to your audience, look suitable based on your/client goals, and have decent domain authority if that is important to you. Moving swiftly onto the world of qualified optimised content – is there such a thing? Well aside from SEO Review Tools, Search Console, Moz and other tools, here’s another for the mix; Google Ads’ Quality Score. Quality Score is used by Google to keep advertisers and PPC practitioners in check and ensure campaigns are running at best-practice. The benefit of this is cheaper traffic, so it’s an essential as part of life as a PPCer (before Google moves the goal posts again!). The Score itself is made up of 3 parts; expected CTR, ad relevance and landing page experience – the latter of which we deem most important in the great SEO/PPC crossover. Google Ads data should be used to find keywords with a ‘Below Average’ landing page experience – and these should be prioritised depending on search volume. The quickest wins come from improving landing pages with high-volume queries, and you can also use Ads data to find new landing page keywords too (because who keyword stuffs anymore anyway). Google is getting smarter at understanding variants – such as jumpers and sweaters being a similar item of clothing despite search volumes differing by country – and this exercise is great for giving Google a helping hand and your landing page appearing more relevant for close-match search terms. If you’re broaching your PPC agency/in-house team for this information, a great place to start is asking them if they run any Dynamic Search Ad (DSA) campaigns. Once regarded as the lazy way to launch PPC, they’ve found their niche for not only improving customer loyalty, but also the expanding reach of the most tightly-optimised Google Ads account. If you haven’t launched a DSA campaign yet, a small budget gains you a lot of valuable data; it’s great for understanding what Google thinks your page is relevant for. Think of it like Search Console but for PPC – and a great way to learn upcoming keywords that may have slipped through the cracks when optimising the first time round. Source new keywords using Dynamic Search Ad campaigns, and update your landing page with any high impression/click search queries if you’ve got an awareness/traffic objective, or high conversion/conv. Value queries if you’re working to sales or revenue objectives. Lastly, it’s time to utilise unspoken ‘is it a ranking factor, is it not?’ data from Google Ads to improve organic CTR. First stop, Google Search Console. Get your benchmark CTR and Position; last three months if your client is seasonal, otherwise the last 12 months’ data is just as good. It’s best to export this data, and plot your keywords to understand where your high-potentials are; these take the form of queries with a high Position but low CTR (compared to your 3-month and 12-month averages). And there we have it, three ways to improve SEO practices using PPC data – now go have fun testing them in the wild! Head of Paid Marketing at Silverbean, a Newcastle-based digital marketing agency specialising in driving sales performance across PPC, Social, Affiliates, Organic Search and Conversion Rate Optimisation. 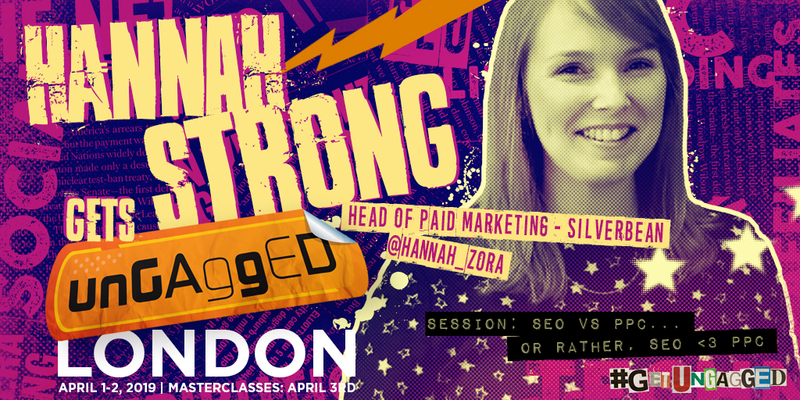 Dig even deeper into SEO and PPC at Hannah’s UnGagged session, SEO <3 PPC on 2 April.